Quick Fact: The most striking feature of the babirusa is its face. A pair of tusks erupt through the top of the snout and curve back toward the eyes. These upper canines resemble antlers more than they do tusks, giving the babirusa their name, which translates to “pig-deer”. Learn more: visit the The Wild Pig Specialist Group to learn more about babirusas and their native habitat in Indonesia. The babirusa is one of about a dozen wild pig species scattered across Africa, Europe, Asia and the surrounding islands. The babirusa is found on the tropical Indonesian island of Sulawesi (formerly Celebes). Very little is known about this shy, forest-dwelling pig’s habits in the wild. The babirusa is a dull grey color with very little hair; Adult males can weigh up to 100 kg (220 lbs). The adult males have the characteristic curving tusks, while females have much smaller tusks. It is thought that the male babirusas’ curving tusks may protect their face and eyes from the slashing lower tusks of an opposing male during altercations. The males are also known to stand on their back legs and ‘box’ during fights. Babirusas are thought to be omnivorous due to the anatomical structure of their stomach and digestive tracts. Although there is little information about their diet in the wild, babirusas in captivity have been observed catching and eating small mammals and birds. They also consume a large variety of leaf, root, and a significant amount of fruits. They have even been observed standing on their back legs to reach fruit and leaves. Babirusas normally give birth to 1 – 2 piglets after 155- 158 days of gestation. Babies weigh less than 800 g (1.7 lb.) when born. They may begin to leave the ‘nest’ and to sample solid food as early as 10 days of age. They may live up to 24 years in captivity but the age in the wild may be no more than 7 – 12 years. Babirusas are considered a social species and groups of up to 13 have been observed in the rainforest, especially around water, communal wallowing areas and salt licks. They are good swimmers and have been observed to cover long distances in the water. 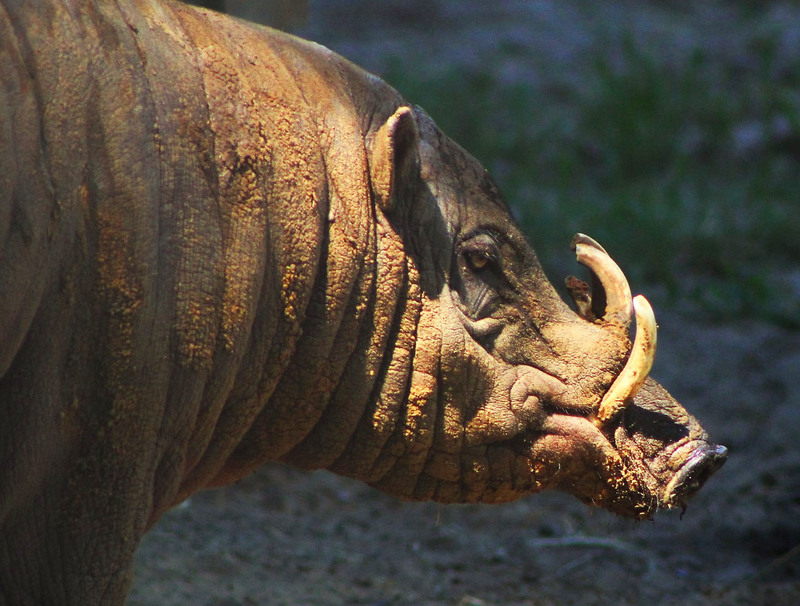 Conservation: The babirusa is listed as Vulnerable on the IUCN Red List. They have few, if any, natural predators. Hunting by humans, through snare trapping, constitutes the main threat to the population in Sulawesi. The traps are being set for the Sulawesi Warty pig, but babirusa are frequently caught in the same snares. 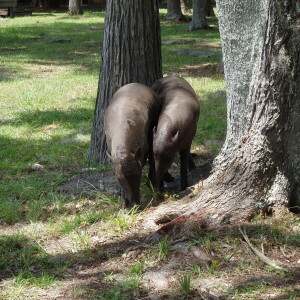 The babirusa is also threatened by commercial logging and habitat degradation. The babirusa is considered the Asian pig species with the greatest need of immediate conservation measures. White Oak is joining with other zoological facilities such as the St. Louis Zoo and the Bronx Zoo to establish a breeding program for this vulnerable and enigmatic species.